A business park at South Yorkshire’s expanding international airport is taking off with occupiers and investors. Barnsdales have completed the sale of two more units to the British Association of Sport and Exercise Medicine (BASEM), with two more deals in the pipeline. 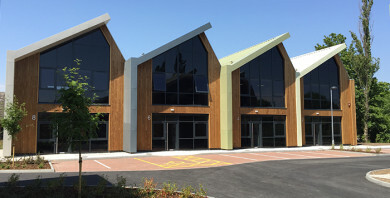 Craig Gooddy, Senior Surveyor at Barnsdales, said the Fountain Court Workpods at Doncaster International Business Park, next to Robin Hood will be more than half full when the forthcoming deals complete. He said: “Activity at Fountain Court has really taken off this year and it’s proving a very popular location. Some of the new occupiers like it because of the proximity of the airport and the accessibility to the motorway network via the new Great Yorkshire Way. Others like the style of the development and the quality of the units. “BASEM have relocated from a business centre on the other side of Doncaster because they saw this as an opportunity to own their own premises. They’ve taken two adjacent units in Jetstream Drive and the extra space will help them develop their services. BASEM, a charity, is the largest multidisciplinary sports medicine organisation in the UK and was founded in 1952. Its aim is to provide support and education to all healthcare professionals involved in the care of athletes and individuals undertaking or aspiring to undertake regular physical activity at all levels.